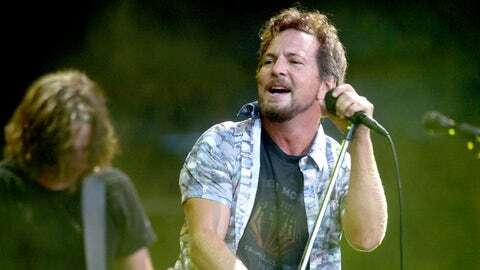 Sorry, Eddie Vedder, you're not welcome in San Francisco this week. Well, the arms race is escalating. The Seattle Seahawks decided to ban California residents from buying tickets to Sunday’s NFC Championship Game at CenturyLink Field (FOX, coverage begins at 5:30 p.m. ET). Well, for all those hoping that maturity would somehow work its way into the forefront, keep waiting. One San Francisco radio station, LIVE 105, has decided to ban all Seattle bands from its airwaves in the days leading up to the game. Got a hankering to hear some Soundgarden? No dice, you’re out of luck. Alice in Chains? Nah, son!